Aliens: Colonial Marines Introduces "Escape Mode"
Team up with four friends to escape another four friends hoping to lay eggs in your chest. FPS Multiplayer has certainly come a long way since the initial days of Deathmatch and Capture the Flag games. While it certainly may not be appropriate for every game, when done correctly multiplayer modes go a long way towards extending the lifespan of a game and letting players enjoy their titles for a little bit longer. The key words in that previous sentence however are "when done correctly". For example, in the case of Aliens: Colonial Marines, the competitive deathmatch mode might be fun, but it's not necessarily representative of the tone of the series. But Gearbox's recently announced Escape Mode, which forces players to escape a facility with Xenomorphs nipping at their heels? That's a different scenario entirely. 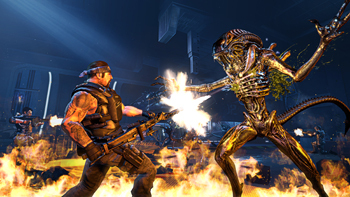 Escape Mode will feature two teams of four, one Marine and the other Xenomorph, with competing objectives. Marines will work against the clock to navigate their way through a level before the timer runs out while the Aliens rush in to violently prevent them from doing so. For either side to succeed, members will need to work as a team and take advantage of any weaknesses the other side presents. Escape Mode is the second Aliens: Colonial Marines multiplayer mode that Gearbox has announced, not counting the drop-in drop-out co-op available optionally in the story campaign, and there may be more to come. Gearbox has stated that there will be "a number of competitive modes" available in the completed game, so with another six months before launch there may be further multiplayer reveals in the very near future. Aliens: Colonial Marines will release worldwide for XBox 360, PlayStation 3, and PC platforms on February 12th, 2013.